After 6 weeks of hard work, Coda finally graduates. 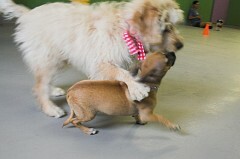 If you've ever wondered what goes on at puppy kindergarten, here are some pics. 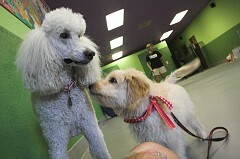 This class is put on by Cindy at Dogs Etc. Coda and his buddy, Fred the bug-eyed weirdo. Fred takes Graduation very seriously. Coda is the class bully.